This section describes the preference options that apply to general-purpose editors (see the figure that follows). SQL properties that can be set include the SQL_MODE, case sensitivity of identifiers, and the SQL delimiter used. Default SQL_MODE for syntax checker: Optionally configure the SQL_MODE for the SQL editor's SQL syntax checker. The document property SqlMode defines SQL_MODE for all operations affecting SQL parsing at the document scope. The purpose of this option is to preserve the consistency of SQL statements within the document. Sets the SQL_MODE DBMS session variable to the value stored in the SqlMode property of the document when performing reverse engineering, forward engineering, or synchronization operations. 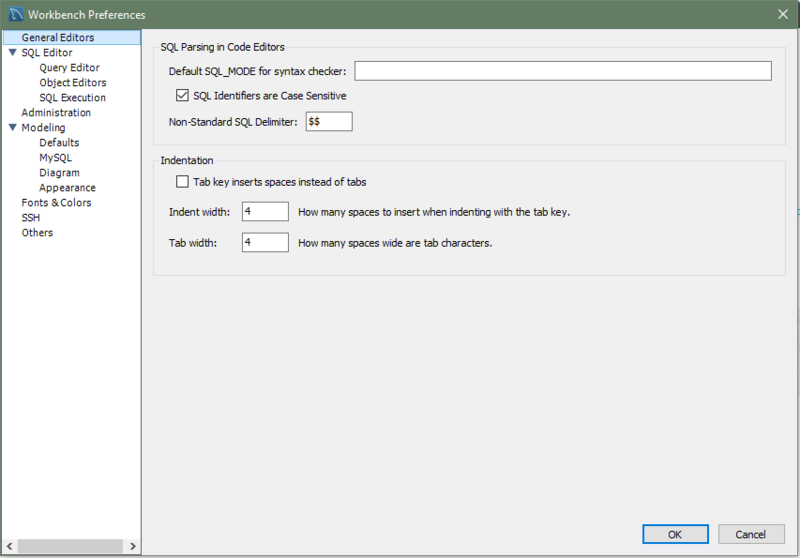 Honors the SQL_MODE values defined in SqlMode so that SQL parsing is correct. Only a subset of all possible SQL_MODE values affect the MySQL Workbench SQL parser. These values are: ANSI_QUOTES, HIGH_NOT_PRECEDENCE, IGNORE_SPACE, NO_BACKSLASH_ESCAPES, PIPES_AS_CONCAT. Other values do not affect the MySQL Workbench SQL parser and are ignored. If the value of SqlMode is not set, the default value of the SQL_MODE session variable defined by the server stays unchanged during operations with the server. However, the MySQL Workbench SQL parser behaves as if SQL_MODE is also not set. This may potentially lead to inconsistencies in parsing of SQL statements stored in the document. If you choose to not set the SqlMode property, ensure that the default SQL_MODE variable defined by the server does not contain any values from the following list: ANSI_QUOTES, HIGH_NOT_PRECEDENCE, IGNORE_SPACE, NO_BACKSLASH_ESCAPES, PIPES_AS_CONCAT. The SqlMode property is defined in two locations: globally and at document scope. MySQL Workbench uses the global property to initialize the document property for each new document created. For each document, the property value defined at document scope always has higher priority over the one defined globally. [ ] SQL Identifiers are Case Sensitive: Whether to treat identifiers separately if their names differ only in letter case. This is enabled by default. Non-Standard SQL Delimiter: [$$]. Define the SQL statement delimiter to be different from the normally used delimiter (such as ";"). Change this if the deliminator you normally use, specifically in stored routines, happens to be the current setting. This preference section was added in MySQL Workbench 6.2.4.